Hello everyone! 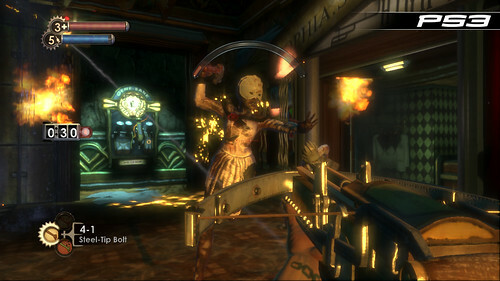 We’re incredibly pleased that BioShock is coming to the PLAYSTATION 3. Now that the news is official, we’re very much looking forward to sharing a little more about what our team is doing to bring the game to life on the PLAYSTATION 3. We’ll be using this space over the coming months to tell you about new developments, new features and any interesting happenings around our offices. We’ll also be debuting exclusive content like the screenshots embedded in this post. But first things first – before we get into too many details, let me tell you about the fantastic team that’s working on the PS3 version of BioShock. The project is based in the 2K Marin studio, which is located in Novato, CA. The 2K Marin team has been collaborating with the 2K teams in Australia and Boston to build the game with team members in each of the studios building, coding, optimizing, bugfixing, and polishing away. On top of that, because this is the first PS3 title from 2K Marin, 2K Australia and 2K Boston, we’ve also got another development partner with some outstanding PS3-specific coding chops helping out with the project – we can’t talk about what studio that is yet, but we look forward to revealing that in the future. For today, we’ll give a brief “who’s who” for the three 2K studios that are working together on BioShock for the PS3. 2K Marin: We started the 2K Marin studio in November of 2007 with a group of eight people who migrated across the country (and in some cases, the world) in order to continue working on BioShock. The core 2K Marin group includes the Executive Producer (me! ), our Creative Director, Jordan Thomas (designer of the Fort Frolic level), Lead Programmer Carlos Cuello, and Lead Artist Hogarth de la Plante. All the aforementioned folks worked on the original version of BioShock. We’ve also got some extremely talented programmers including Ray Graham (previous titles include Godfather, The Simpsons, NBA 2K, and NBA Street) Johnnemann Nordhagen (formerly from Sony’s R&D group), David Pittman (previously of Stormfront Studios), and Jake Etgeton (also from the original BioShock crew), who are currently hard at work making builds and squashing bugs. 2K Australia: During BioShock development, Australia was the home of the tech team – the guys who worked on the core engine and rendering features that brought to life the gorgeous visuals of Rapture. Five members of that team, Mathi Nagarajan, Ben Driehuis, Daniel Lamb, Weicheng Fang, and Tim Cooper are now working on the PS3 version, focused on rendering, graphics and optimization. Their goal is to make the game run amazingly well on the PS3, and they’ve been making tremendous progress so far on that front. 2K Boston: The Boston team is the largest chunk of the BioShock team at the moment; many of them hard at work on some of the as-yet-unannounced components of the PS3 version. I can mention the work of one Boston team member, Ian Bond, who has been optimizing and refactoring the physics simulation for the game to take the maximum advantage of the PS3 hardware. It can be tricky to coordinate the work of so many teams across so many time zones (the Boston team has almost no overlapping working hours with the Australia team); we make liberal use of phones, videoconferencing, forums, emails, and travel to keep everyone aware of what’s going on. The good news is that with all these teams on the case, development on the PS3 version goes on for roughly 18 hours a day! That’s a brief overview of the teams working on the PS3 version. In the future, we’ll go into more depth about what’s different and what’s new in the upcoming release. We hope that you’re excited about BioShock coming to PS3 as we are, and we’ll see you again soon! Wow, a third party dev posting on Playstation.blog. I played/loved the 360 version and i will deffidently be picking it up for PS3. It’s nice to get the feeling that this isn’t just “a port” and that there are a lot of resources working on this. This was one of the few games that the “other system” had that I was truely jealous of and wanted to play. Now that I get to partake in this GOTY on the PS3…I can’t wait! Thanks for bringing it over! Only problem I have is that this comes out around the same time as Silent Hill, Fallout 3 and LBP, all games Im definitely getting. Crap, Im gonna be broke this year. I can’t help but wonder why months of 18-hour work days are needed to port a game with the art, sound, models, levels, storyline, etc. already done. That’s an honest-to-God question, not a troll. I realize there is engine work and optimization and we’re likely to see Home integration and such… it just seems like if we’re seeing those screens _now_ that this has been in the works a while and I’m just a bit surprised it’s months and months away. While I wasn’t a fan of the game when it launched, I totally recognize having a competent version on the PS3 is valuable to those that haven’t played it. I was always “technically” impressed by the game, it just didn’t grab me. I’m really looking forward to this game, and it’s exciting to hear that the dev’s are taking their time with it. Glad you guys are still on good terms with 2K after they leaked in game xmb. Looks great, can’t wait! Please support 1080i/p output for those of us without 720p TVs. Thx for the leaked ingame xmb :), anyway, im definalty buying this game, looks awesome. The super-secret Dev team helping out couldn’t be Naughty Dog could it? They haven’t been announcing any new titles so far, so this could be really cool. Any info on a demo coming? Sounds great. Thanx for the detailed info. you guys are RETARDED! how do you rate this any less that a 5 out of 5 for a blog post. i swear i think some people who don’t even OWN a PS3 come by the blog just to rate each post low. lol. but seriously…very good news very good post very excited to play this game and find out what extras we’re getting. game of the year plus extra content? if i could i would of rated this post a 6! lol. BioShock remains one of my favorite games of all time. I’m highly excited to see what you guys plan to do to make the PS3 version unique. Never played Bioshock but I might just have to pick it up on the PS3 because of how great it looks! I hope that guys make a good job porting Bioshock to PS3. Lost Planet is a shame and a awful port. “Bioshock” is one of my most-played 360 games, and definitely one of my favorite games of this decade. Glad to see it finally coming to PS3. Depending on what that extra content is, I may need to add this copy to my “collection”. BioShock on PS3? HELL YEAH! Well, this is the best news I have read on this blog since Qore was announced. So, where are those BioShock pictures with in-game XMB? I think this is the 3rd, 3rd party developer to come and write a blog post here. Anyway, I’m excited and cannot wait to play Bioshock on the PS3. From the looks of it, you guys are working hard on it. Now I am curious as to which forth team his helping you code for the PS3. great work but i have a fews thing i want to ask will u guys be answering back to us? what made u guys decide to make it a xbox 360 exclusion at first and what change your mind?what can i expect to make me pick it up on ps3 when i already got the 360 version great game by the way? I’m glad to see that this isn’t “just another port.” Thank you for pleasing so many fans with this. I’m wondering if they fixed the FOV issues for the PS3 version – the ones they fixed for PC but not for 360. It would be nice to read directly from you guys what are the differences on working in both console versions. Do you use higher definition textures and higher polygon models for the ps3? Tell us tell us!!! Your next projects will be multiconsole too? I love it when 3rd party devs come and share there info on the Playstation blog, keep it up ! 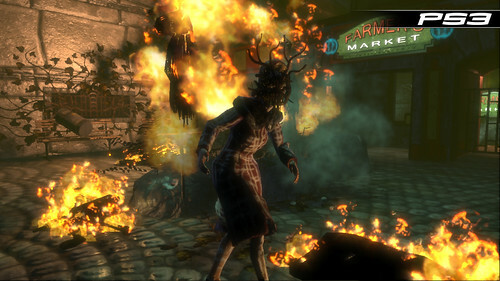 Bioshock on PS3 is amazing news and will be a sure hit once it’s released. I played it on PC not long ago but I am definitely buying it for my beloved PS3 ! looks great and cant wait! This game won’t hold up on the ps3, all there is to it. It came out to critical acclaim last year on the xbox 360 and it is known as one of the best games of all time… that won’t transfer over to the inferior hardware of the ps3 with the lack of AA and unified ram. I don’t care who’s working with 2k2 to bring them up to par with the ps3 hardware, the game won’t hold up on the ps3. The game already looks blurry and the reason for that is to hide the lack of full scale aliasing the ps3 can’t do. I almost bought an Xbox360 for this game. Good thing I waited. Samething happened to me when Oblivion came out. Patience is a virtue. fantastic! I played in my bro’s 360, and the game seems great. To bad i jsut dont liek the 360 lol. I can’t wait for this awesome game on a console im more fimilar with! Looking forward to reading more posts on Bioshock for the PS3, can’t wait to see some more new content. Queso, you know I’m right. The ps3 simply lacks the unified ram and AA to be a real contender with 3rd party developers. With their in house guys and developers they pay to make games for them, yeah… the ps3 can produce some pretty good looking stuff. R&CFTOD, Uncharted and Lair are all testiments to that but in the end they would probably look even better on the xbox 360’s hardware. Interesting. I loved this game and downloaded all the extras on Live. Glad to see it coming to the PS3. I’m wondering what 2K is going to do to lure me into the double dip. I’m not against buying it a second time IF you guys make it worth my while. One or two extra plasmids won’t do the trick. Maybe an extra ending or two? New areas? More moral choice? I know you can’t change the game that much but something’s got to be added for me to buy it again. Otherwise I won’t even rent it. Why bother? For the PS3 gamers who haven’t played Bioshock, go and get it on day one regardless of extra content.